Navy Senior Chief Petty Officer Kraig M. Vickers, 36, of Kokomo, Hawaii, was assigned to an East Coast-based SEAL team (Naval Special Warfare Unit) where he was working as an Explosive Ordnance Disposal Technician. On August 6, 2011, SCPO Vickers and 29 other service members died when their CH-47 Chinook helicopter was shot down in Wardak province, Afghanistan. A graduate of Maui High School in 1992, SCPO Vickers attended Evangel College in Missouri on a football scholarship. He decided college wasn’t for him and joined the Navy in November 1996. SCPO Vickers had been trained as a Bomb Disposal Specialist, Expeditionary Warfare Specialist and Freefall Parachutist. He’d served for 15 years. Those who knew him say he was a fearless, intelligent, and easygoing family man. “You couldn’t find a nicer guy,” his former football coach remembers. 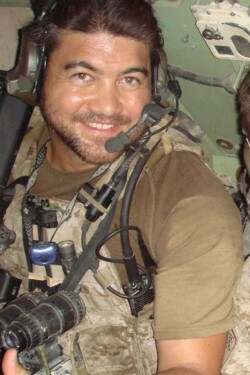 “He played middle linebacker, so he was really smart; the quarterback of the defense and when he put on his helmet, no one could match his intensity and aggressiveness.” A highly decorated SEAL, SCPO Vickers decorations include: three Bronze Stars with “V” for valor, Purple Heart, Joint Service Commendation Medal with Combat “V”, Navy and Marine Corps Commendation Medal and many others. His three children are recipients of the Folds of Honor Children’s Fund Scholarship.